much to do with the water cooling the soil down as the requirement for water. We did have some crocus flowers to show him like these first few Crocus banaticus flowering in a pot. And some slightly weather battered Crocus kotschyana in a raised bed. But to impress him our Crocus vallicola were still putting on a wonderful display showing a considerable variation in flower shape as well as the degree of the violet markings on the petals. Some have almost no violet at all while others have strong lines and a wash of violet all the way up to the wispy tips of the petals. 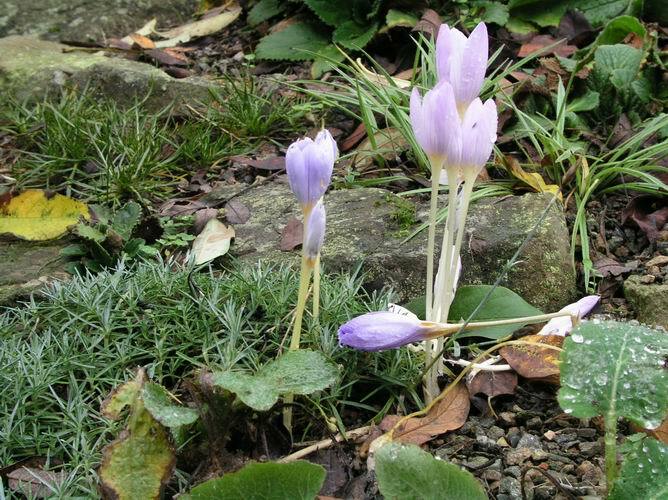 The small Crocus vallicola in the pot has been grown under glass and shows clearly the difference in size the same plant can be when growing in different conditions. I mostly grow our Crocus vallicola in open frames but this wee seed pot had for some reason got scooped up and grown in a bulb house beside some of the other crocus resulting in a flower about 1/3 of the size of similar seedlings outside where they are always cool and moist. I was also pleased to let him see a group of the white form of Crocus nudiflorus called 'Orla' which has a slight wash of violet/grey when it first opens then it turns white. Even better is the seedling in the pot which I raised from seed collected from 'Orla'. I have kept and sown all the seeds we have had from 'Orla' (left) in the hope of getting another white form but all have turned out to be the typical purple/blue of C. nudiflorus except this one. It is pure white from the start and has more pointed petals than 'Orla' I have been busy cross pollinating to see if we can get a good seed strain that can be relied on to give a high proportion of whites. As C. nudiflorus corms produce lots of small offsets these forms can be propagated quite well clonally but it is always good to have more than one form so all our corms are not in one basket! It was only when looking for the shoots pushing through the gravel that I noticed a seed capsule just appearing in this pot of Crocus caspius. This is one of the many bulbs that I did not get around to repotting this summer and as it does not push the seed capsule up as they ripen, like some of the other Crocus, I nearly missed out on this harvest. Gently tipping the gravel off the top of the pot I discovered several more full seed capsules, giving me a good enough crop to justify making a new seed pot. Remember that I sow my Crocus seeds at least half way down the pot to get best results. It makes me wonder how this seed is distributed in the wild. It would not be advantageous for the seeds to stay by the parent bulb as the competition would become intense so there has to be some outside help to spread the seed. Ants would seem an obvious choice attracted by the sweet appendage on each seed but other possibilities could be birds, or is it possible that the autumn rains bring a deluge of water that washes down over the dry earth spreading the seed as it goes? A lovely short Colchicum species is also in flower in the bulb house. It is one of the Greek species that I find almost impossible to distinguish between and have never managed to put a name to. Coming from Greece it should be no surprise to learn that it hates to be too wet. After the initial two storms I rarely water directly into the pot letting it take up its moisture from the moist sand below; the only exception is when I give it a dose of sulphate of potash on a hot sunny day sometime in the spring. 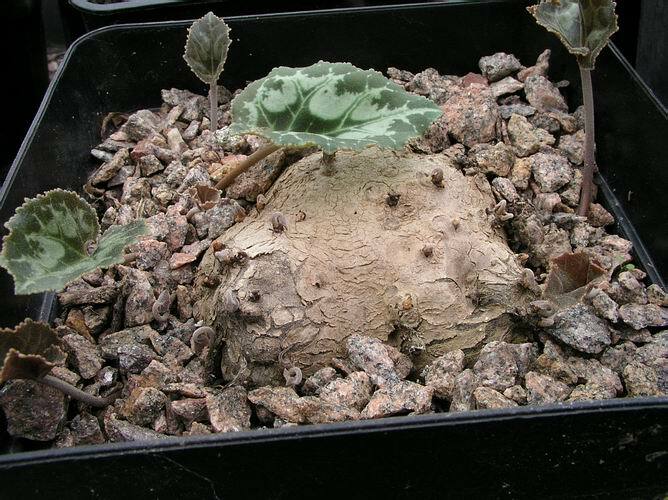 There have been some very interesting comments on Sternbergias in the forum recently and it would seem that most people are as confused as I am as to exactly which species we are growing. This is one of many forms we got as Sternbergia sicula but I am not sure that that is the correct name. 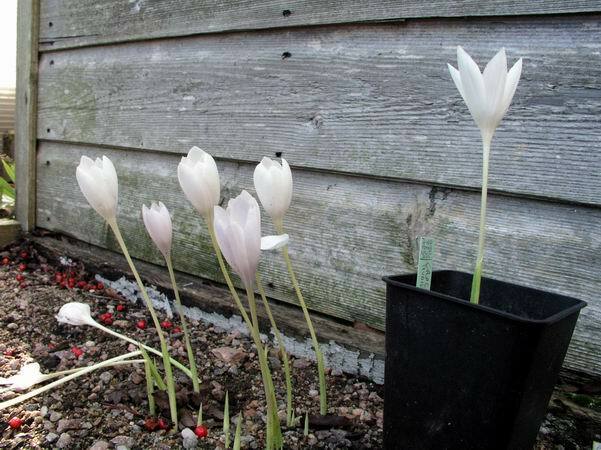 I think the one on the left is more like Sternbergia sicula, flowering ahead of the leaves which, when they appear, should be narrow and often prostrate unlike the large flowered form on the right, flowering with the leaves. While these leaves are no where near as broad as the leaves of Sternbergia lutea they are wider than I expect from true S. sicula and it would appear to me that this is just like a small narrow leaved version of S. lutea (angustifloia). Another possibility is that we have a hybrid swarm; I would be delighted if anyone can throw more light on this subject. 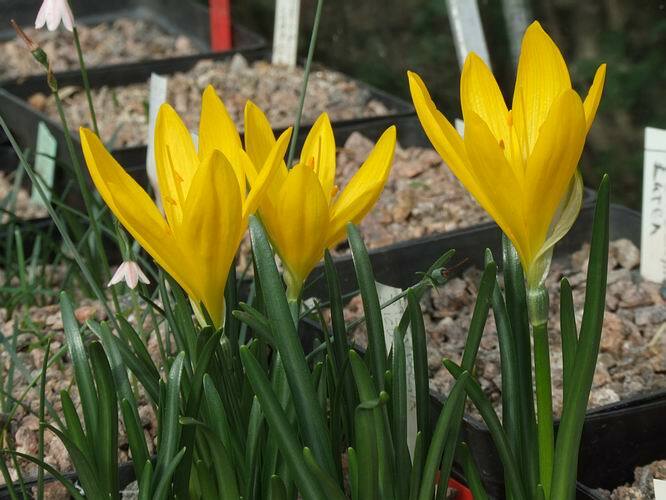 Another query appeared over Sternbergia greuteriana; this is what we grow under that name. It is very different from any of the others we grow and I have no reason to doubt that it is the correct species. What ever muddle we all get in over getting the names correct, never let it put you off growing the plants; their beauty is sufficient reward for our efforts. Cyclamen graecum and it has taken me all of the three years to nurse them back to life. In the first year nothing much happened at all, in the second year roots started to form and this year I found some nice fat roots coming through the bottom of the pots when I checked them in the summer. I made sure the sand plunge around them remained moist so that while the tuber was dry in its pot the roots had moisture to survive. Now I am being rewarded with a lot of active buds appearing all over the tuber and sending out leaves. I doubt if I will be able to put give it the summer heat to stimulate a good show of flowers but I will try for a few years and if I fail I will pass them on to a new manager further south who will give them a better home. A few more autumn bulbs in the garden to finish off this weeks log - a colchicum we received as Colchicum laetum and Eucomis autumnale.